What do we see through Peruvian native Corina’s prism of Pop, folk, and meditative music? Not the jumble of a kaleidoscope, but rather the clarity of the human creative spirit, which has the same basic structure in all the cultures of the world. The Azú Project is a groundbreaking fusion Afro Peruvian Music and Jazz with pop infused elements mainly. The Saraswati Inti Project is a blend of Indian, Andean and American pop. Now her project is called “Prisma Project.”Prisma Project is a Cosmic Pop Fusion style she has coined. Her new CD is titled “Ocean Mundi. Corina Bartra was the first vocalist to blend Afro Peruvian, and Creole music & Jazz. She also pioneered subtle and exciting instrumental textures in her compositions and her arrangements. She writes extensive intros, interludes, and solos filled with inventive rhythms and beautiful harmonies. She also guides her musicians to do so. With this approach, she adds an instrumental section to her unique & historic projects. Corina is an impressive versatile and multi-project artist; she has already ten CD’s recorded. Seven CD’s with her Afro Peruvian & Creole Jazz infused projects. Two CD’s as well came before she founded the Saraswati Inti group, which were Chants from the Seeds of Bliss & Ecstatic chants from the Infinite. Now her latest “Ocean Mundi,” is here to celebrate her adventurous and innovative music career. Synthesis. Corina Bartra has been trying to reconcile the exciting music of multiple cultures—Pop, Andean, Oriental and World influences—her entire music career. Now she has done it in her exciting new album, Ocean Mundi. What do you get when you attempt such an ambitious understanding of different genres and creative impulses? You get a synthesis. And it is a very pleasing synthesis. 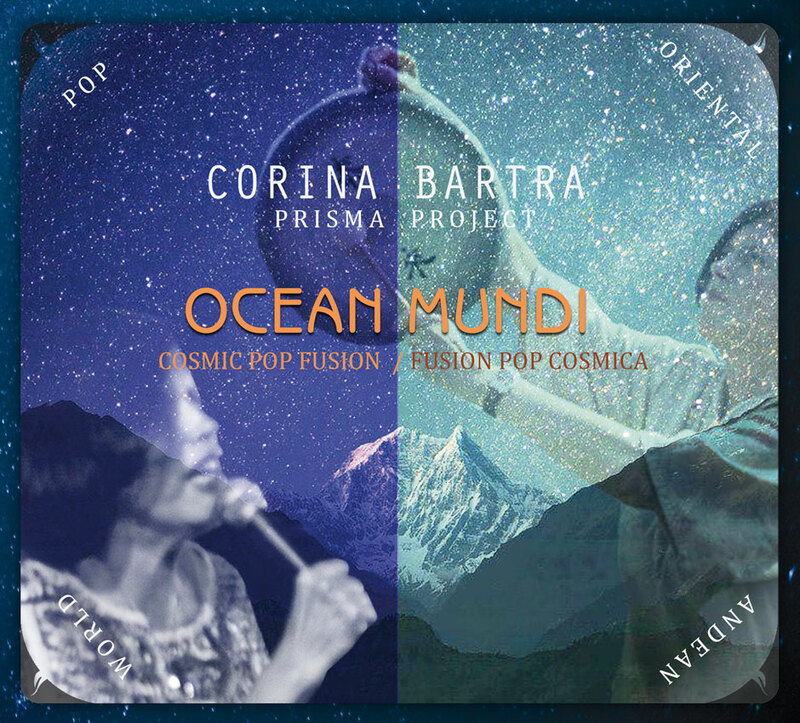 The songs of Ocean Mundi, Corina’s Prisma Project, her “cosmic pop fusion,” are beautiful and full of bright spirit. Roam this blithe, spirit-driven record and form your own favorites. Maybe it is a Corina original or anonymous folk song in Spanish. Or the sudden English version of Dylan’s “Knocking On Heaven’s Door.” Mine has to be the beautiful Corina’s “Ganesha Sharenam,” which segues from an Eastern-Western fusion into a chorus of “Gam Gam Gam Gam,” Ganesha’s Bija (seed) mantra. Yummy, this song is delicious! And so is the whole album. Síntesis, Corina Bartra ha tratado de reconciliar la música excitante de varias culturas- Pop, Andina, Afro Peruana, Oriental e influencias del Mundo.- Toda su vida. Ahora lo hace en su Nuevo y excitante Nuevo álbum, Océano Mundi. Que es lo que uno logra cuando uno intenta una comprensión tan ambiciosa de diferentes géneros e impulses creativos? Uno logra una síntesis, y es una síntesis muy placentera. Las canciones de Océano Mundi, El proyecto Prisma de Corina, su” fusión Pop Cósmica,” son bellas y llenas de espíritu. Que cosa es lo que vemos a través de Corina, nativa de Perú en su prisma de Pop, Folk y música meditativa? No el revoltijo de un kaleidoscopio, pero la claridad del espíritu humano creativo, que tiene la misma estructura básica en todas las culturas del mundo. Deambulen por este alegre espíritu en el CD para formar sus favoritos. Quizás sea uno de los temas originales de Corina Bartra o un anónimos de música folk en español. O la repentina versión de Dylan’s “Knock,Knock, Knocking on Heavens Door”. La mía es la bella “Ganesha Sharenam.”de Corina que va desde una fusión Oriental- Occidental a un coro: Gam Gam Gam Gam.” Ganesha’s bija 9 semilla) mantra. Yummy! Esta canción es deliciosa! E igualmente todo el álbum.